The tigress found dead in the premises of Chitwan National Park on Sunday. As tigers prefer to set up their own territories, they don't stand when other tigers encroach their territory. Tigers often fight with each other for food and territory and the injuries sustained during such fights are fatal. 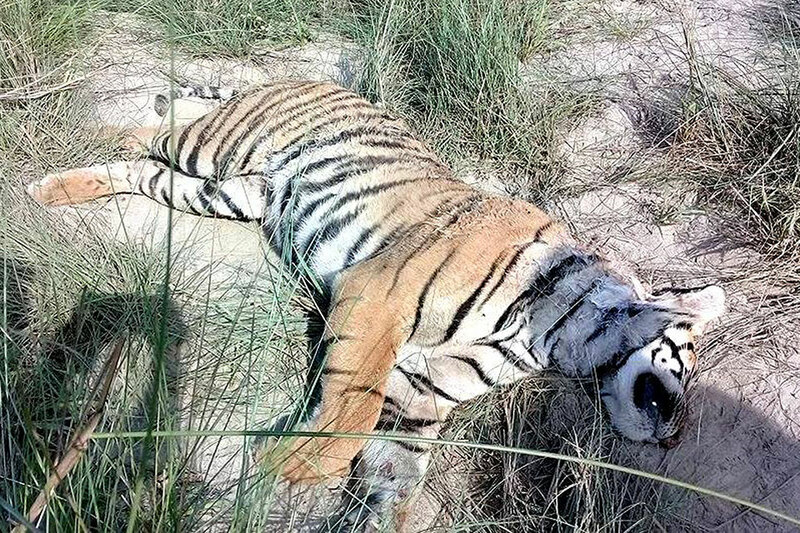 CHITWAN, April 23: With the death of one more female tiger on Sunday, a total of five tigers have died in Chitwan just in a short span of ten months of the current fiscal year. Nurendra Aryal, information officer and assistant conservation officer at the Chitwan National Park (CNP) informed that a female tiger was found dead on Sunday morning in the part's eastern part in Sauraha. The carcass of the tigress was recovered from the bank of the Rapti River. As informed by Information Officer Aryal, the tigress was not more than three years old and had a serious injury in the neck. "Postmortem report showed that the tigress died due to the neck injury," said Aryal, adding, "It had sustained injuries during a territorial fight with another tiger." Earlier, on March 24, another tigress was found dead in the eastern part of the park near Khorsor. Coincidentally, that tigress too was three years old. It had sustained injuries in the head and abdomen. As the tigress was recovered several days after death, its body had already started decaying, Information officer Aryal informed Republica. Kedarnath Poudel, the chief of the District Forest Office, Chitwan expressed concern over increasing numbers of tiger deaths. Similarly, a tiger was found dead inside Panchakanya community forest of Ratnanagar Municipality ward no.11 on April 20. The tiger was reportedly 12 years old. The postmortem showed that the tiger had preyed on a wild boar. "It also had wounds in its neck which proved it was involved in a fight with another tiger," said Aryal. A month before that, a dead tiger was recovered from Tikauli forest. But that tiger had succumbed to old age, according to Chief of DFO Poudel. This tiger too was recovered several days after its death and was around 12 years old. In July, an old tiger was found dead on the bank of Khageri River of Barandabhar area in the park. According to Poudel, that tiger had died days after the devastating floods. The maximum lifespan of a tiger is 15 years. Tigers live for 12 to 13 years on average but once they get old they have to struggle for habitat and food. Both the tigers that were recently found dead inside the CNP were around three years old. Tigers stops living with their mother after reaching the age of two years. 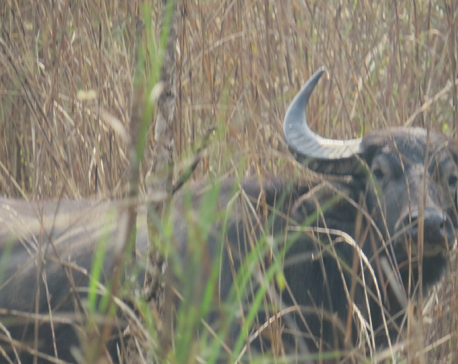 After this they start making their own territories, informed CNPs Conservation Officer Ved Dhakal. "It becomes really challenging for the cubs to find and adjust in a new habitat," Dhakal said, adding," There is a high risk of them being attacked by other tigers." As tigers prefer to set up their own territories, they can't stand when other tigers encroach their territory. Tigers often fight with each other for food and territory. The injuries sustained during such fights often lead to their death. As per the last census, there are altogether 198 tigers in Nepal of which 120 are in the CNP.